Friendly, informative, professional service which I have a lot of confidence in and really look forward to my next appointment knowing my teeth are in good hands. Would you like the perfect smile? Why not book a cosmetic consultation for your own tailored smile design. Root canal treatment seems to be one of the most feared and misunderstood dental treatment available. I thought i would provide a guide to root canal treatment, outlining what it is, why you might need it and alternative treatments. This may give you a better understanding of the treatment and possibly correct a few myths. The tooth that you feel and see in your mouth is only the tip of the iceberg. Underneath the gum, the tooth extends for about another 1.5cm in the form of the root. This root has a tunnel running through its entire length, from the tip of the root, up into the tooth itself. This is the root canal. This tunnel is where the tooth’s nerve and blood supply enters from the surrounding jaw bone. 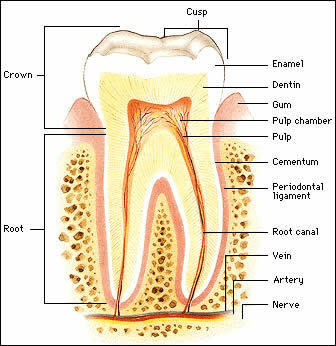 The nerve and blood vessels enter into the pulp chamber in the tooth. This chamber is a larger space which houses the nerve and blood supply in the middle of the tooth. Occasionally this nerve and blood supply is “killed off” or inflamed. This is most commonly caused by deep decay. When deep decay becomes close to this pulp chamber, the bacteria and their toxins can invade the pulp chamber. This causes massive inflammation of the nerve and blood vessels, which you feel as toothache. If this inflammation continues, the nerve and blood supply can die off, leaving the bacteria free to live in the pulp chamber and root canals. If this bacteria gets comfortable and grows in big enough numbers, an abscess can form, which again, you may feel as toothache. At this stage the only solution to keep the tooth is root canal treatment. Other reasons why a nerve dies off include trauma or deep fracture lines under old fillings. Root canal treatment is the process of cleaning the pulp chamber and root canals, then blocking them up with a rubber based filling material called Gutta Percha, to prevent further bacteria living in large numbers in the tooth. Sometimes it is performed on a “dead” infected tooth, and sometimes the tooth is still alive, but so inflamed that a regular filling would not settle it. This is known as “irreversible” inflammation, and essentially means the nerve and blood supply is in the process of dying off. During root canal treatment, the decay is removed from the tooth, then the pulp chamber opened and cleaned. Then the root canals are found. These appear as very small holes in the floor of the pulp chamber and can be very challenging for dentists to find sometimes. Teeth very often have more than one root canal. An upper molar for example, most commonly has four root canals. Once the canals are found, they are cleaned thoroughly using special root canal treatment files and a strong antibacterial flush. Once the length of the root canals have been found, they are widened slightly, and then filled with Gutta Percha. The tooth can then be filled with a temporary filling and restored permanently at a later date. The simple answer is that your dentist will tell you! If you suspect that there is a problem with your tooth, you must always go and visit your dentist. It may be that you do not need root canal treatment yet, and some other treatment may settle the problem. All too often, i find patients having root canal treatment on teeth that could have been saved with a simple filling had the patient attended earlier. So don’t put off those small fillings that your dentist tells you are necessary, because they are not giving you any trouble, because when they start to give you trouble, they are probably past filling! Root canal treatment used to be done really badly. Often i hear stories from patients about this treatment being carried out with either inadequate or no local anaesthetic. If the tooth is still alive, then obviously this would be an unpleasant experience. But don’t worry. Dentists are much better trained in root canal treatment in current times and equipment and techniques have changed drastically in the past ten years. People associate root canal treatment with pain, because often they are in pain when they need it. So the dentist who carried out the treatment in the past may have done so with the utmost of care with more than adequate local anaesthetic, but because the patient was in a great deal of pain at the start, this is the overriding memory of the treatment. Pain or discomfort is however fairly common for a few days after the treatment. For the majority of people, this would only be mild to moderate. There are of course some individuals who respond unfavourably and may have a more severe experience in the days following the treatment. Thankfully these people are few and far between. Can any dentist provide root canal treatment? The short answer is yes. All dentists, as part of their undergraduate training, are qualified to provide root canal treatment. Some dentists do not like to perform this particular treatment so they may refer their patients to a colleague or to a specialist. A specialist in root canal treatment is called an Endodontist. Usually, Endodontists see the more complex cases that perhaps a general dentist does not feel comfortable to treat. An example of a complex case would be a tooth that has a severely curved or hooked root. Root canal treatment is available on the NHS, however some NHS dentists are less than keen to provide this treatment on the NHS, due to the funding they are given for this treatment and the amount of time and equipment required. Now my tooth is root treated. What’s next? This really depends on which tooth has been root filled and what state the tooth is in after. As a general rule of thumb, if the tooth is a molar, it ought to be crowned. When teeth are root filled, they become much more brittle. As molar teeth take a lot more force during chewing, they are liable to fracturing or even splitting. If a root canal treated tooth splits, sometimes it may need to be extracted. Crowning molar teeth after root canal treatment prevents fracturing and splitting. Also if a tooth is very badly damaged and there is little enamel left, then a crown is usually the best restoration for the tooth. However, a front tooth which has minimal damage can usually just have a filling after root canal treatment. If a tooth is infected, or irreversibly inflamed as described above, usually the only alternative to root canal treatment is extraction. It is important to understand that antibiotics will not cure an infected tooth. They will relieve a painful swelling associated with an infected tooth, but they will not remove the source of the infection in the root canals. The only way to achieve this is through root canal treatment or extraction. If you have any questions about root canal treatment or about a tooth you feel may need root canal treatment, send our dentist a message here , an he will be happy to help with any queries.